A papal astronomer won recognition for his ability to communicate accurately and clearly the discoveries of planetary science to the general public. 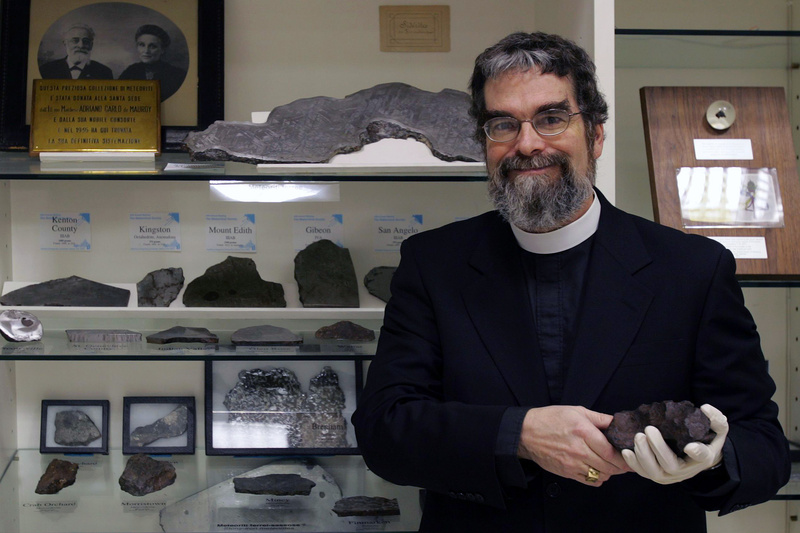 U.S. Jesuit Brother Guy Consolmagno, a planetary scientist and meteorite expert at the Vatican Observatory, was awarded the prestigious Carl Sagan Medal for "outstanding communication by an active planetary scientist," said the American Astronomical Society's Division for Planetary Sciences, which chooses the annual prize winner. In addition to significantly contributing to the public understanding of and enthusiasm for planetary science, Brother Consolmagno "occupies a unique position within our profession as a credible spokesperson for scientific honesty within the context of religious belief," the division said in a press release on July 2. Through his many books, public lectures, interviews and multimedia presence, Brother Consolmagno "has become the voice of the juxtaposition of planetary science and astronomy with Christian belief, a rational spokesperson who can convey exceptionally well how religion and science can coexist for believers," it said. A native of Detroit and graduate of the Massachusetts Institute of Technology, the Jesuit astronomer has been at the Vatican Observatory since 1993, where he is now coordinator for public relations. He credits his communication skills, in part, to his family lineage of Vaudeville entertainers. "At heart I am a storyteller," he told Catholic News Service by email July 15. "I learned that from my father and he learned storytelling from his uncles, who were in Vaudeville a hundred years ago. "So when I present science, I look for the story to tell. What is the setting, who are the characters, what's the challenge, where is the climactic moment when the insight changes the way we look at ourselves and our universe? The story of the universe is the story science tells; so I tell it as a story," he told CNS. Brother Consolmagno said he can "read an audience" and tries to "play out the suspense just far enough" to keep people hooked and to hit the highlights with humor. "I am not trying to get folks to remember facts, but instead I am trying to get across a way of looking at the universe," and help people see a new point of view, he said. He said being a Jesuit "has made all the difference" in being able to communicate his Catholic faith in the public forum. "I can concentrate on communicating my passion for my science and let my collar do the rest of the talking for me. It has been one of the greatest blessings of my vocation," he said in the email. In the church's mission to better communicate that it is not opposed to science, but embraces it as an important human endeavor to understand God's creation, Brother Consolmagno encouraged all Catholic scientists and engineers to talk about their work in their parish communities. "Often it is the religious folk who need the most to hear about how God reveals himself through science," he said. "I would encourage people of faith to be public about their science among their fellow parishioners -- talk about your research, start astronomy or computer clubs with young people or retirees. "Show them that our religion does not tell us what 'facts' we can believe, but rather our religion gives us the reason why we go looking to try to understand those facts," he said. After earning degrees in planetary science, Brother Consolmagno was a post-doctorate lecturer at Harvard College Observatory and at M.I.T. before serving in the U.S. Peace Corps in Kenya where he taught physics and astronomy. He entered the Jesuit order in 1989 when he was in his late 30s. His research focuses on meteorites, asteroids and the origin and evolution of small bodies in the solar system. He was honored for his work by the International Astronomical Union in 2000 with the naming of an asteroid after him, the "4597 Consolmagno," a small, 12-mile-wide rock orbiting near the sun.